The phrase applies to why Raritan Bay exists today. Raritan Bay is evolving as rising sea level floods the valleys of the Raritan and Hudson rivers and other smaller streams that drained into the New York Bight. The location of these valleys is directly related to the southernmost extent of the Pleistocene glaciers and the complex topography and geologic history of southern New York and northern New Jersey. Meanwhile, the endless battle between land and sea eroded and deposited sediments on the coastal plain and continental shelf. These forces, influenced by the eustatic rise and fall of global sea level, caused the shoreline to wander back and forth across the coastal plain. During the highest standing seas (during the Late Cretaceous) sea level may have been as much as 300 feet higher than today. (All of the coastal plain was under water, and ocean waves crashed against the ancestral Watchungs and other resistant rocky hills further inland. Staten Island, a monadnock of Paleozoic serpentine, must have been a small, rocky island far offshore.) Transgressions (inundations on the land as sea level rose) and regressions (as sea level fell or as sediments accumulated along the shore) are recorded in the geologic record as numerous sedimentary rock formations of the coastal plain. Each of these formations contain selectively preserved fossil remains of organisms that lived (and died) during times when the coastal and marine sediments of these formations accumulated. Today, these formations crop out intermittently along the shores of Raritan Bay and along streams carved into the Atlantic Highlands region of New Jersey. Late in the Tertiary great changes (on a geologic scale) began to occur. Sea level fell from its last high stand in late Miocene time into early Pliocene time (roughly between 16 and about 4 million years ago. Evidence for this high stand is the occurrence of white quartz pebbles (or orange due to iron stain) that can be found practically everywhere on hilltops and on stream terraces throughout the Atlantic Highlands region and beyond. This quartz gravel, which is frequently a brown conglomerate held together with "bog iron"-type cement, is called the Beacon Hill Gravel after an exposure on top of Beacon Hill in Monmouth County, NJ. It also forms the resistant caprock of low hills in the Pine Barrens region, and can even be noted in abundance mixed in glacial deposits on Long Island. Sea level began to fall and rise "rapidly" (in geologic terms) as cycles of glaciation waxed and waned as time progressed into the period of the Ice Ages. Each glacial advance "competed" with the previous glaciation cycle for greater low latitude advance and duration. Long cold periods when ice accumulated on land (causing sea level to fall) were punctuated with shorter warm periods which allowed the ice to melt, (causing the seas to advance onto coastlines around the world). The last several glaciation cycles were perhaps the most extreme. Each cycle wiped out most evidence of the previous cycles, their histories preserved in far-scattered outcrops on land and in cycles of sedimentation at sea. As ice accumulated rivers that drained into the northern regions were blocked and diverted southward. The advancing ice surged southward scouring the landscape and carrying rock, older till, soil, and remains of forested landscapes and deposited them as glacial drift and moraines. The effects of last glacial cycle, the Wisconsin Glaciation, is most evident on the landscape. Estimates vary, but near the end of this cycle, between 18,000 and 14,000 years ago, sea level was possibly 100 to 150 meters lower that its current elevation. The great Wisconsin age continental glacier had advanced haltingly southward to its maximum extent, with its terminal moraine accumulating across the cress of what is now Long Island (the Ronconcoma and Harbor Hill moraines). These moraines coalesce across the crest of Staten Island, and continue westward into New Jersey following a path north of the Raritan River toward New Brunswick, and on westward into Pennsylvania. This great ice sheet had overrun a landscape that had been sculpted and buried numerous times by previous glaciers. Each advance resulted in the blockage, ponding, and rerouting of streams and rivers, sometimes forming great lakes (such as ancient Lake Passaic). In the New Jersey region when the ice was at its southernmost extent the major drainage from the melting ice flowed southward across "the saddle" in the central New Jersey lowlands to the vicinity of Trenton. Massive quantities of sediment (mud, sand, and gravel) were carried southward down the Delaware River contributing sand to a very transient system of barrier islands along the New Jersey coastline (which were far offshore from their current location). Longshore drift and shelf currents carried the sand and gravel fractions northward along shore while winnowing away the mud to be deposited in bays, wetlands, or far out on the shelf and beyond. Staten Island must have appeared as a buttress against the advancing ice. The "modern" Hudson River was under ice with features like the Palisades and the mountains of the Highlands region forming great crevasse fields as they disrupted the flow of ice. Terminal moraine and ice blocked the Verrazano Narrows. Drainages from the glaciers in the southern New York area created a vast outwash plain south of the ice sheet extending southward to the shore (far to the south and east of its current configuration). Streams coalesced to form an ancestral Hudson River that carved a valley in the Raritan Bay area. For a time the ancestral Hudson River flowed down the valley of Arthur Kill (between Staten Island and New Jersey) and joined the Raritan River. It flowed eastward beyond the current location of Sandy Hook, then flowed southward into the Hudson River canyon - a submerged canyon carved, in part, by submarine erosion as sediment-laden water flowed as dense turbidity currents to sediment fans in on the abyssal plain beyond the continental plain. Some authors suggest that the Hudson flowed southward from the vicinity of Sandy Hook to another canyon far offshore in the vicinity of Barnegat Light, NJ. The influence of glaciation on the geometry of Pleistocene shorelines and drainages on the continental shelf will supply curiosity for research well into the future! Sediment from the Raritan River, however, is filling in the valley faster than sea level can flood the shorelines. This is probably a reflection of the impact of human activity (deforestation, and agricultural and urban development) more than any natural cause. Raritan mud is accumulating in portions of the bay at a rate of about .75 inches per year. Portions of the valley that were once exposed several thousand years ago are now buried about 150 feet deep in mud. The influx of mud aids in the development of the tidal wetlands and marshes along the south and western ends of Raritan Bay (including the wetlands preserved in Cheesequake State Park). Sand dominantly covers the sea bottom in the lower portion of the bay whereas mud dominates the bottom throughout the middle portion of the bay. Archeological evidence suggests that humans were already in the region at the close of the Pleistocene (probably actively contributing to the mass extinction of a variety of North American wildlife at the end of the Pleistocene). The early "Big Game Hunters" gave way to village-style living ("tidewater communities") that subsisted on hunting and gathering marine shellfish, and eventually, agriculture. In pre-Columbian times "woodlands cultures" probably centered in the Ohio Valley region became the dominant influence in the region (probably quite aggresively). Large shell middens were found around Raritan Bay and on Staten Island, a testament of the utilization of the bay for food by Indian tribes (Lenapes) that occupied the region when early Colonialists arrived. (Unfortunately, early settlers used these shell piles for road construction and field fertilizer!). In the 1600s oysters grew in two large beds in the western end of the bay. The largest measured oyster bed was about a mile across and was located just beyond the mouth of the Raritan River, and was continuous with oyster beds that lined the lower river estuary for as much as five miles upstream. A smaller oyster bed, called the Chingarora bed by the Lenape Indians, was located in what became Keyport Harbor. Oysters also grew abundantly along the tributary rivers of the Raritan Bay, including the East, Hudson, Navesink, and Shrewsbury rivers, as well as along most of the Arthur Kill and in southern portions of Newark Bay. The oyster beds were located where salinity ranged from about 5-15 ppt at the end of tidal ebb flow. Shellfish ecology is a useful measure of physical characterisics of the bay. Oysters grow about half and inch per year in salinity ranges from 5-10 ppt, and about an inch per year in salinity ranges from 12-20 ppt. Higher salinity allow other encrusting marine organisms to take space away from oysters (algae, barnacles, bryozoans, and slipper shells). Hard clams (Quahogs and Mercinaria) are distributed over most of the bay and inhabit both sand and mud. They live below the intertidal zone in areas with salinity above about 15 ppt. Soft clams are abundant in the intertidal zone near the mouth of the bay, especially in the Atlantic Highlands area where salinity is higher. Raritan Bay is the southernmost bay where American Lobsters can live. South of the bay they can live in the cooler waters out on the continental shelf. Raritan Bay is the northernmost area where blue crab occurs in large numbers and are abundant almost every winter. In the summer they migrate to the river tributaries of the bay (Hudson, Raritan, etc.). A large counter-clockwise gyre affects the mixing of waters in the bay. Residence time for water in the bay is about 60 tidal cycles. The salinity ranges from a low of about 12 ppt at the bottom near the mouth of the Raritan River, to about 32 ppt off Sandy Hook. Water temperatures range from about 33 degrees f in late January to 78 degrees f in late August. The mean tide range is about 5.5 feet with coastal storm surges ranging to as much as 12 feet or higher. Winter winds are dominantly from the northwest, whereas summer winds are from the south and southwest. Hurricanes are most likely to affect the region in August through early October. Nor'easters (winter storms) are most likely to affect the region during late November to mid April. Wide tidal flats are exposed during the lowest spring tides. These tidal flats were up to a mile wide during low tides during the 1800s and early 1900s; coastal landfills and "shore management practices" have developed much of these shallow areas along the south and western sides of the bay. The development and utilization of the marine resources of Raritan Bay can be compared to the traditional views of American West. On the more romantic side, the lucrative fishing industry and Nineteenth and early Twentieth centuries helped to support a stable population around the bay, and helped, in part, to feed the flood of immigration. Stable communities continued to grow and change with new industries supporting a larger population base. For instance, Perth Amboy, NJ was the capitol of the East Jersey colony and was a provincial capitol until near the end of the 1700s. Advances in methods of fishing and shellfish collecting resulted over extraction of these resources from the bay. The peak of the fishing industry occurred in the late 1880s to 1910s. Fishing and farming slowly gave way to industries including ship building, ceramics, paint, electrolytic copper refining, chemical manufacturing, and petroleum refining. In the Sayreville, NJ area huge pits were dug to extract the clays for ceramics and bricks, and huge chemical dumps, fly ash piles, and landfills were created to accomodate the waste from the growing industrial empire. The building of shore management structures (dikes, groins, seawalls), the spraying of DDT (and other pesticides) to control the mosquito problem, the carving of ditches to drain wetlands, the filling of shore lowlands, the channelization of creeks, highway construction, sewer construction, neighborhood construction, and a myriad of point and non-point sources of household, automobile, industrial chemicals, and ocean dumping all contributed to growing toxicity and the bay. Chemical wastes cause stress and disruption of the life cycles of plankton, shellfish and other invertebrates, and the fish, birds, and other wildlife they supported. The result was ecological disaster. The bay approached sterile conditions at the peak of pollution and algal bloom-induced anoxia. Environmental action during the 1970s to present have helped slowly bring back sea life, but nothing compared to the wealth of marine resources of the past; certain species of fish and birds continue to decline, and the introduction of tenacious exotic species from around the world contribute to their decline. On the otherhand, changing environments are inevitable, and catastrophes of greater scale than the modern human invasion have happened in the past. 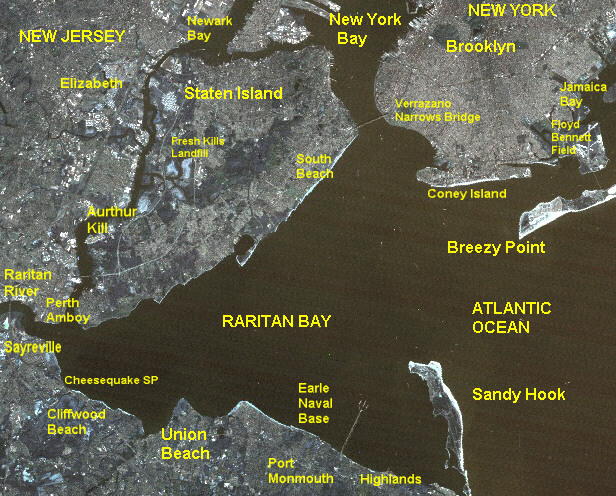 The world of Raritan Bay was a cold, barren tundra with sediment-choked streams. In as little as 10,000 years, with humans present from the onslaught, the landscape evolved into a diverse desiduous forested region on land, whereas equally catastrophic or opportunistic changes probably affected the marine habitats. Today, with the help of humans, there are more species living in the region (wild, exotic, and domestic) than perhaps any period in the past. 1) Ban the use of fertilizers and pesticides, especially yard chemicals, immediately! The go directly into the groundwater, then into the bay. Not enough is known about these chemicals to justify their use, their accumulation, and their fate in the environment. 2) Stop irresponsible urban growth policies! Monster-sized houses surrounded by manicured lawns may be what the wealthy want, but a forested woodlands and wetlands are healthier for the environment. Redevelop land that has already been disturbed. Build high rise-type buildings with high quality waste management systems. Replace shore developments with parks and wetlands with a long-term "buy back" plan. 3) Remember small cars with clean, efficient engines? If bike paths existed they would be heavily used! 4) Use detergents (clothing, dishwashing, and cleaning) that are "environmentally safe" (don't be fooled by "empty" promotions!). In general, don't buy or sell any chemical product that you wouldn't eat. 5) Despite the fear and anxiety, recreational fishing needs tighter controls. One rabbit in the garden isn't so bad, a herd of them is another story. 6) Spend tax money on sewers that "work" to keep the environment clean. Ban septic systems. Every creek that drains into any tributary, anywhere, needs a densely wooded buffer zone to help filter sediments and runoff. Road and parking lot runoff should be treated like sewage. Every creek bed should be a park or nature preserve! 8) Promote industrial development that is environmentally safe. Gas emmisions from any smoke stack shouldn't be anything more than C02 and water. Solid waste should be completely inert, non- toxic, non-nutrient. Everything else must be converted to this condition. 9) Enforce environmental regulations. NY & NJ don't need polluting industries in our economy. Why let the greed of a few ruin the wealth of many? Besides, a cleaner environment lowers medical costs, increases real estate values, creates jobs, and improves the "quality of life" of everyone! Mackenzie, Jr., Clyde L., 1992, The Fisheries of Raritan Bay. New Brunswick, NJ: Rutgers Univ. Press, 306 p.
Edwards, R. L., and A. S. Merrill, 1977., A reconstruction of the continental shelf areas of Eastern North America for the times 9,500 B. P. to 12,500 B. P.: Archaeology of Eastern North America, v. 5, p. 1-44. Bokuneicicz, H., 1988. A brief summary of the geology of Raritan Bay. In, Hudson/Raritan Estuary: issues, resources, status, and management. Proc. of seminar held February 17, 1987, Washington, D.C., p. 45-57. Kraft, H. C., 1977. The paleo-Indian sites at Port Mobil, Staten Island. Current perspectives in northeastern archaeology, 17, p. 1-19. Squires, D. F., The bight of the Big Apple. The New York Sea Grant Institute of the State University of New York and Cornell University. Albany, NY: NYSG-RS-81-00. Return to the Geology and Geography of the New York Bight Homepage.